Packed 600 Pcs. per Cs. Toblerone is made from some of the finest raw materials from around the world. Reawaken your taste buds and immerse yourself in Toblerone’s unique taste experience. 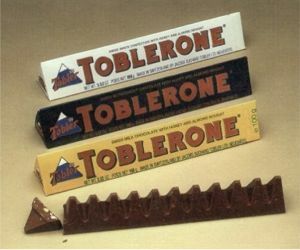 Toblerone originates from the chocolatier's family name "Tobler" combined with "torrone", the Italian word for nougat. There are a great many legends about Toblerone’s triangular shape. Chocolate lovers around the world have always believed that Theodor Tobler took his inspiration from his mountainous homeland, and in particular the Matterhorn with its characteristic triangular shape. But according to Theodor’s sons, the Toblerone bar was modeled on something sexier - a red and cream-frilled line of dancers at the Folies Bergères in Paris, forming a shapely pyramid at the end of a show. Toblerone’s name, its chocolate peaks and unmistakable pack are instantly recognized throughout the world.